Usually on Wednesdays I focus on my work-in-progress crafts, but today I wanted to do something different. Aggression in dogs not an easy subject to discuss in general, and it’s certainly not one that most dog owners like to acknowledge. But, I think it’s important. This surprises people. They hear “aggressive” and think pit bull, not cocker spaniel. They don’t understand how a “good dog” (which Penny most assuredly is) can be aggressive in any way. Before I go on, I want to make it clear that I am not a vet, animal behaviorist, animal trainer, or any other sort of professional who deals with animals, aggressive or otherwise. If you have a dog you think is aggressive , seek the advice of a professional immediately. I adopted Penny from South Los Angeles animal shelter in 2008. She was a 3-year-old stray. At intake, she was underweight, had scabs that looked like they were from cage wires, and had recently nursed puppies. I later learned she wasn’t sure what windows were, was scared of things like brooms and frying pans (! ), and was so terrified of having accidents that the one time I came home to a mess she was hiding in the closet. Then Penny started getting sick from chronic, untreated stomach issues and ear infections. The first five months, she was in and out of vets several times a month. The fear aggression was a surprise. On our first walk, we were at a crosswalk and she turned into a growling, snapping monster when she saw the person across the street. Later, it was the clerk at the pet store. Pretty much any time she was unsure of her surroundings, she would lash out. With the vet bills rising, I couldn’t afford a consultation with a behaviorist; so, I started reading books on fear aggression. Lots of them. And I began training her myself. I made a lot of mistakes, too. After 5 years of counter-conditioning, Penny is a much happier dog. She’s still learning how to trust, but she tries. She can even spend the day at work with me without growling. But fear aggression is something you can’t just “fix” once. I learned that when I took her to the ARF fundraiser walk two Sundays ago. I put her in a situation where there were several hundred strange people and dogs and she responded by being stressed and reactive. I should have known better than to put her through that. It was a good reminder that even now I need to be mindful of her nerves and her reactions. It’s a process. For those with fear aggressive dogs, here are 10 things that worked for Penny. I don’t know that they’ll work for your dog, but they may be worth trying. Know your dog’s triggers. I had a white board on my fridge where I wrote every specific thing Penny reacted to. Eventually I narrowed it down to people approaching Penny straight on, Hispanic men, wheelchairs, hyper dogs, and children. The list gives you an idea of what to work on—and what to avoid. Don’t try “flooding” your dog with trigger exposure … it doesn’t work. Learn your dog’s body language. The ASPCA has a helpful list of dog body language with pictures. One of the things that helped the most with Penny was realizing how she freezes up right before a freak out. If I can catch it before the fear really sinks in, I can distract her (read: I can bribe her with treats). Read up on fear aggression. The Cautious Canine by Patricia McConnell is my favorite resource for fear aggressive dogs. It’s a small pamphlet (about 60 pages) that focuses, step by step, on how to recondition your dog in a positive way. Get it, read it, love it. I also really like this website. Train with a Gentle Leader head harness. 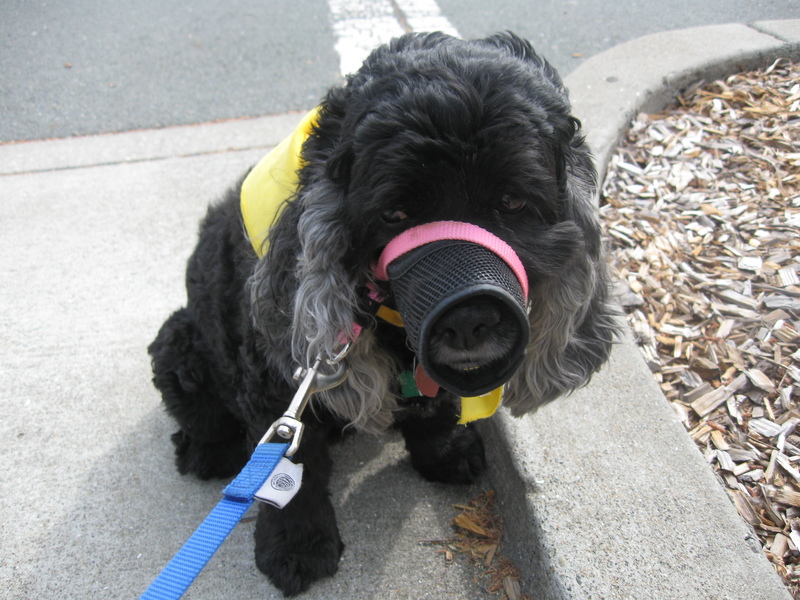 A lot of dogs—including Penny— don’t like a head collar, but it makes her so much easier to control. If she tries to lunge, it turns her in a little circle. I usually only use it for training now, but it helped a lot in the beginning. Let her growl. A growling dog may be embarrassing for you, but let her growl! Growling warns people that she’s not comfortable. Fear aggressive dogs trained to not growl often jump straight to lunging, snapping, or biting without warning. Trust me, you want warning. Provide a different behavior that’s accepted. For Penny, this was down/stay. Sit wasn’t enough. It needed to be something she could really focus on instead of the scary thing. And then, when she’d calmly lie there, I’d praise her like crazy. Eventually, whenever she got nervous she’d automatically lie down … much better than lunging! Train in a controlled environment. You want to build up to the scary stuff. Friends are a great help with this—I had Penny approach them on her own terms as they sat with treats. Early morning at the pet store was also decent practice because it wasn’t crowded at that hour. Tell people about the fear aggression, by name, before they approach. I sometimes lie a little and tell people Penny was abused. I don’t know if the abuse part is true or not, but people respect Penny’s space more if they hear that (go figure). Go to the vet and rule out health problems. Penny’s ear issues made it so that she couldn’t hear people approaching. Some of her more erratic fear behaviors calmed once her ears were healthy. Be calm. Be patient. Know your (and your dog’s) limits. This is going to be a long process, and it doesn’t let up. You have to always “be on” whenever your dog is in public. You have to be the calm, patient leader. There’s probably years of bad behavior that you’re trying to overcome as quickly as possible. You’re going to get lots of dirty looks. People will say things, like how your dog should be put down, that will make you cry. Penny still has bad days, and there are things that Penny will probably never be comfortable with. That’s okay. And, hard as it is, if you can’t handle a dog with fear aggression or don’t have the time, the most loving thing you can do is place them with someone who can. It’s not admitting defeat. So those are my 1o tips. Now, I appeal to my readers. Anyone have experience with fear aggressive dogs? What are your tips and stories? Wouldn’t it be awesome if we could build up a list of resources in the comments for fear aggressive dogs and their people? « Finish It Up Friday: More Hexagon Flowers! Thanks for posting on a difficult subject — more power to you! I just found your blog and will be following it now. I’m not into crafts, but I definitely am into dogs. If you like dog stories, check out my website, http://maijaharrington.com. I’m posting chapters from my book-in-progress, “Funny Tails: Adventures and Misadventures in Living with Pugs,” a lighthearted look at life with our 3 pugs plus various foster pugs from Pug Rescue of North Carolina. Readers tell me it’s pretty funny. I came here through the Finish It Friday link and enjoyed reading this. Thanks for the informative and interesting post. Seems like Penny has a great human in you and you a great dog. I’ve bookmarked you and will be back to see what you’ve made as well as reading your well written posts.